Eiga Sai 2013 for FREE ~ Philippine Freebies, Promos, Contests and MORE! 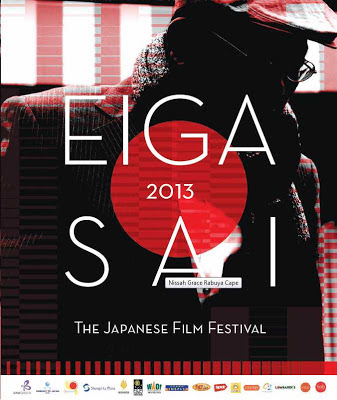 It's time to hit the cinemas and watch great films from Japan in Eiga Sai 2013. This is to celebrate the Philippine-Japan friendship month and also the 40th year of ASEAN-Japan Friendship and Cooperation. With the theme "ASEAN-Japan Partnership: Thoughts Connected- Future Connected", a roster of impressive movies are to be enjoyed by movie goers and film fanatics for FREE! This year's festival will feature About Her Brother, the 3 editions of ALWAYS-Sunset on Third Street, Confessions, Castle Under Fiery Skies, and many more. All films will be shown with English subtitles. To guarantee your seat, rush to the movie venues on the scheduled movie dates at least 2 hours before the screening starts. Watch as many Japanese films as you can for FREE! In the late 1950s, Japan was in a state of recovery from the ravages of the war—developing its economy. In downtown Tokyo, children always played outdoors until sunset and were awaited warmly at home by their families. Akira is an ordinary boy—naïve and serious; Gon is the boss; and, Hakase is a genius. One spring, a new female music teacher and a pretty girl—Shizu, who likes to sing join their class. They decide to join a singing competition in school; ‘DOYO’ (Japanese children’s songs) was their choice and they practice well. However, some boys in the school are found shoplifting; as a result, the class is forced to withdraw from the singing competition… But somehow, Akira and his classmates try to re-enter the competition. There was a strong will to realize Ms. Sakamoto’s wish and Shizu’s dream to become a singer. Nostalgic full length animated film adaptation of the autobiographical novel of the same title by Akutagawa Prize winner, Takagi Nobuko. Set in Hofu City, Yamaguchi Prefecture in the mid 1950’s, a place which still retains historic sites and placenames of the Heian period. The film portrays the warm friendship between a young local girl (Shinko) with a rich imagination, and a girl (Kiiko) who came from Tokyo. Production house MADHOUSE (The Girl Who Leapt Through Time; Summer Wars), completed the film using visually pleasing graphics. Shinko (voiced by Fukuda Mayuko) is an energetic third-grader who has a curl in her forehead that she calls her “Mai Mai.” She loves listening to her grandfather’s stories of the Heian period, and finds herself imaging the lives of those who lived 1000 years ago. When Kiiko (voiced by Mizusawa Nako) came, the ever-curious Shinko finds Kiiko’s unfamiliarity with the local ways to be fascinating. They become fast friends, and spent much time together. They started on a project to stop the canals and build a dammed lake; and, taking care of a goldfish they had discovered. Miyakejima, a small island in the Pacific Ocean, is a six-and-a-half hour boat ride away from Tokyo. There have been eruptions every 20 years on this volcanic island. Here, the Noyama family runs a guesthouse in the sixth district. Shin, a primary school pupil, adores a newborn puppy that he has named Rock. In August 2000, Mount Oyama in Miyakejima erupts violently, forcing the Noyama family to evacuate. At that time, Rock goes missing. One day, Shin and his family miraculously reunite with Rock at a volcanic hazard animal rescue center. However, dogs are not allowed at the shelter. Rock, already not well, becomes increasingly weak, and the family members do not know when they will return to the island. In this situation fraught with anxieties and conflicts, Shin makes a decision. In April 2009, an elderly man named Tadao and his granddaughter Haru go on a trip. Tadao, living in the lonely fishing village of Mashike in Hokkaido, had spent his life fishing for Pacific herring. Retired after injuring his leg, he lives with Haru after his only daughter killed herself. While taking care of her grandfather, Haru worked as a nutritionist, but lost her job when the elementary school that employed her closed down. One day, Haru tells Tadao that she wants to move to the city to find a new job and that one of his siblings should look after him. Tadao gets angry but has no choice; they set off to visit his estranged siblings in Tohoku in northeastern Japan. Their journey consequently revolves around the theme of family reconciliation, as Haru and Tadao come to understand the harshness of life and how precious human relations are. Thus, Tadao looks back on his life and Haru finds a new future.